IMAGE: Released from Quarantine… Post-meeting debris at the Storefront for Art and Architecture, including a couple of interesting books – Medical London by Mike Jay and Richard Barnett and Herzog & de Meuron’s Metrobasel – as well as Matt Leacock’s board game, Pandemic. 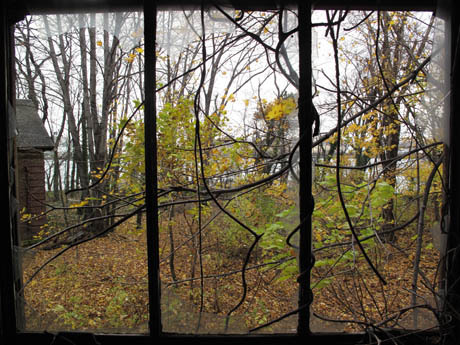 As some of you may know, this autumn, BLDGBLOG and Edible Geography have been co-hosting a New York City-based design studio dedicated to exploring the landscapes of quarantine. 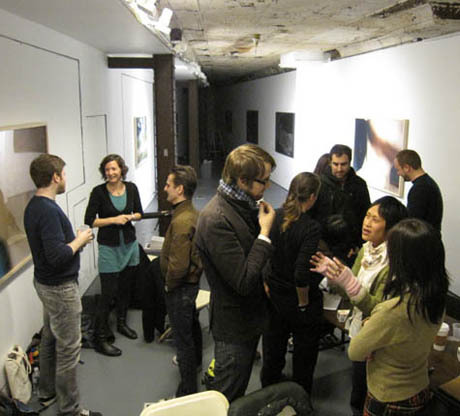 Each Tuesday evening for the past eight weeks, our group of sixteen participants has gathered to discuss the physical, geographical, human, biological, geological, ethical, architectural, ecological, infrastructural, social, political, religious, temporal, and even astronomical dimensions of quarantine – and then come up with individual projects that expand and reflect on one or more of those themes. The night before last was our final meeting, so now that the empty bottles have been taken down to the recycling bin, here are some quick thoughts and photos from our quarantine adventure. IMAGE: Landscapes of Quarantine, Week 6. From left to right, Amanda Spielman, Joe Alterio, Katie Holten, visiting guests Luis Callejas and some of his colleagues at Paisajes Emergentes, Scott Geiger, and Yen Ha. 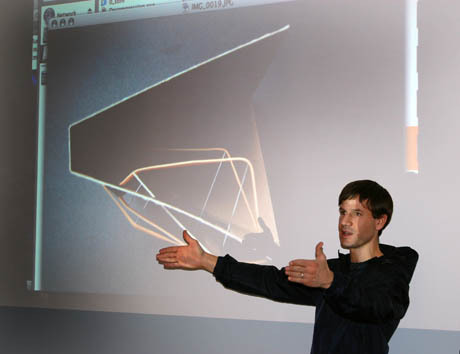 IMAGE: Geoff Manaugh of BLDGBLOG in front of one of Brian Slocum‘s models for a quarantine façade, Week 7. At its most basic, quarantine is the creation of a hygienic boundary between two or more things, for the purpose of protecting one from exposure to the other. It is a spatial strategy of separation and containment, invoked in response to suspicion, threat, and uncertainty. Typically, quarantine is thought of in the context of disease control, where it used to isolate people who have been exposed to a contagious virus or bacteria, and as a result may – or may not – be carrying the infection themselves. According to historian David Barnes, quarantine was simply “an unpleasant fact of life” in most port cities in the eighteenth and nineteenth centuries (and in some cases, earlier: in 1377, Dubrovnik became the first city state to hold ships for a thirty day quarantine, on an island outside its harbour). 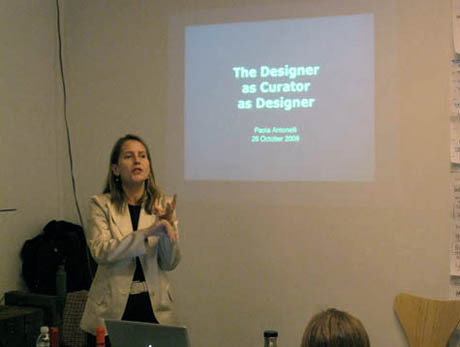 IMAGES: Paola Antonelli, Senior Curator of Architecture and Design at MoMA, addressing the studio during Week 5. This year’s swine flu pandemic has prompted an even greater awareness and enforcement of quarantine – although opinions are divided as to whether it has been effective in slowing the spread of disease at all. 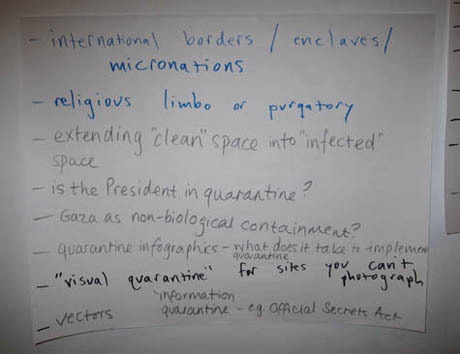 The use of quarantine to restrict individual liberties in the name of public health raises a host of legal and ethical questions that proved a fruitful ground for incredibly interesting discussions of the “dark math” of triage and “acceptable losses.” Game designer Kevin Slavin and comics artist Joe Alterio are both now producing projects that investigate the challenge of shared responsibility and individual decision-making in the face of a deadly disease. 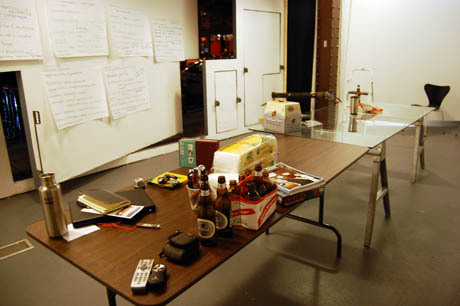 IMAGE: Landscapes of Quarantine studio, Week 6. 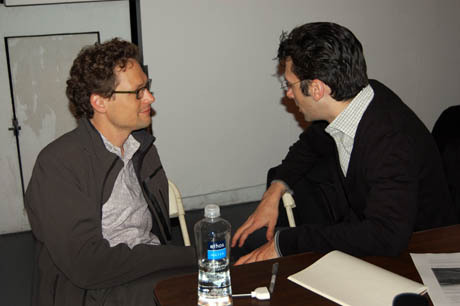 IMAGE: Guest speaker Jake Barton talking with Kevin Slavin, Week 3. On the other hand, several participants identified an undercurrent of absurdity inherent to quarantine, gravitating towards images of bored tourists confined to their Chinese hotel rooms and receiving takeout from biohazard-suited attendants, or the returning Apollo astronauts, denied their tickertape parade and waved at by President Nixon through the window of a modified airstream trailer (which was itself later found, mysteriously, on a fish farm in Alabama). Set designer Mimi Lien and graphic designer Amanda Spielman (in collaboration with her brother, Jordan) are both creating projects that play on these more surreal aspects, with (respectively) evocative, depopulated dioramas of unexpected quarantine locations, and a tongue-in-cheek public health campaign filled with helpful tips on, for example, making the most of your time in quarantine, and relationship maintenance for couples divided by quarantine. 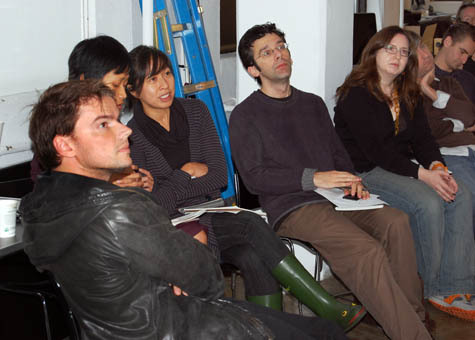 IMAGE: (left to right) Guest critic Bjarke Ingels, Jamie Kruse, Elizabeth Ellsworth, Yen Ha, Amanda Spielman, Thomas Pollman, and Joe Alterio, at Studio-X for our “Concept Crit.” back in October. 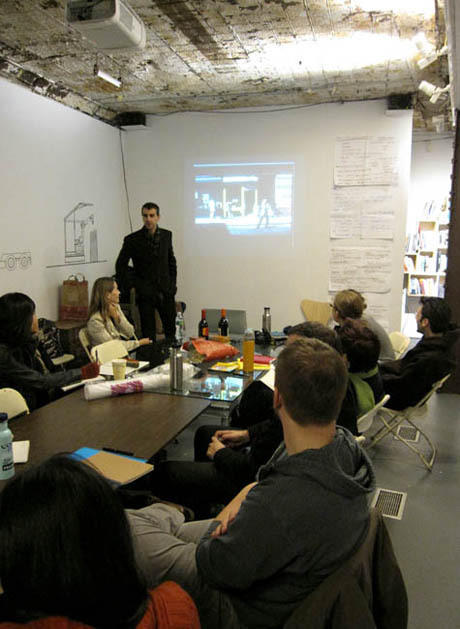 IMAGE: Joseph Grima, Director of the Storefront for Art and Architecture, speaks to the group about the possibilities of the space, Week 5. Of course, quarantine does not only apply to people and animals. Its boundaries can be set up for as long as needed, creating spatial separation between clean and dirty, safe and dangerous, healthy and sick, foreign and native – however those labels are currently applied. 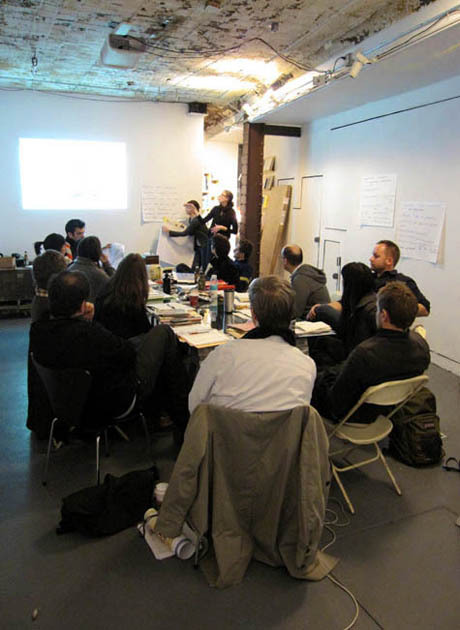 Many of our readings and discussions focused on the technical and extraordinary engineering challenges of designing to prevent the forward contamination of Mars, for example, or the spread of plant pests in an era of climate change. Artists Jamie Kruse and Elizabeth Ellsworth of Smudge Studio are focusing their attention on what they have termed the “limit-case” of quarantine: plans for the million-year containment of nuclear waste in geological repositories around the world. IMAGES: Richard Mosse, Ed Keller, and Thomas Pollman, Landscapes of Quarantine studio, Week 2. 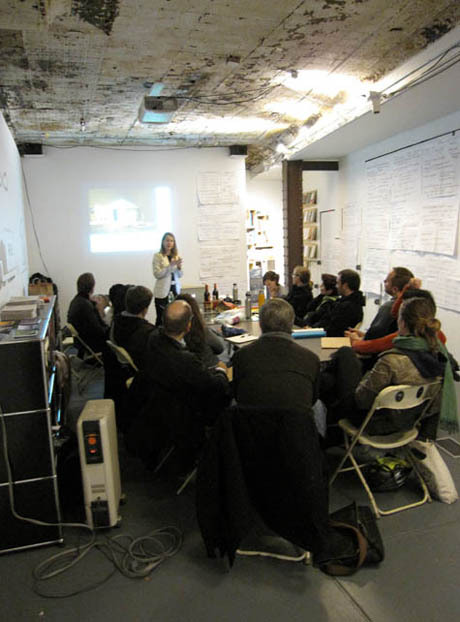 IMAGE: Jamie Kruse presenting at the Landscapes of Quarantine studio. 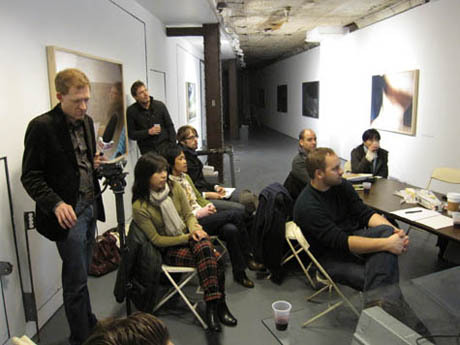 IMAGE: (left to right) Brian Slocum, Jamie Kruse, Thomas Pollman, Mimi Lien, Amanda Spielman, guest speaker Laura Kurgan, Glen Cummings, Katie Holten, Yen Ha, and Michi Yanagishita, Landscapes of Quarantine studio, Week 7. As a project of spatial control, the implications of quarantine ripple outward to affect the layouts of buildings, the shapes of cities, the borders of nations, and sometimes even the clothes we wear. 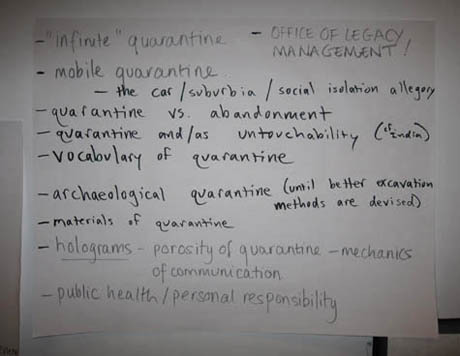 Our discussions have ranged from the fictional potential of quarantine (currently under investigation by writer Scott Geiger) to the infrastructural requirements of quarantine as it applies to both orchids and the President of the United States (architect Thomas Pollman, of the NYC Office of Emergency Management). 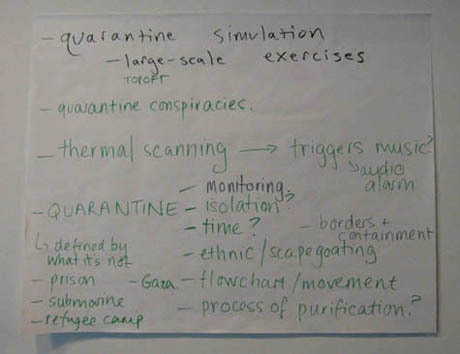 IMAGES: Giant Post-Its filled with notes about quarantine (4 of about 60). 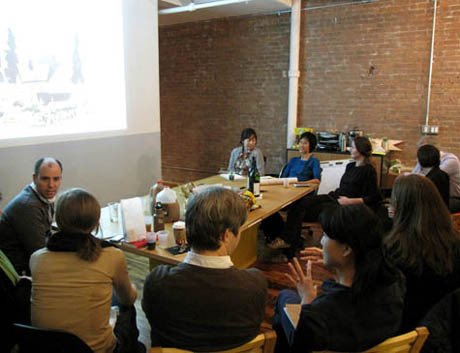 Meanwhile, architects Yen Ha and Michi Yanagishita of Front Studio are addressing the implications of inserting quarantine spaces into the fabric of the city, while architect Brian Slocum has been examining the way quarantine spaces blur the border, sometimes moving it into a bubble inside a country or home, and sometimes externalizing it back to the country or place of origin. 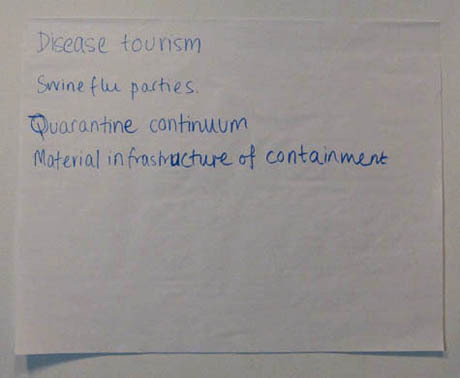 On other evenings, our conversations have revolved around the dystopian overlap between border controls and health screening (the focus of sound artist Daniel Perlin‘s research), as well as what quarantine might look like from the point of view of the vector, bacteria, or virus that it is set up to control (a twist that stems from architect and filmmaker Ed Keller‘s thoughts on networks and political science fiction). 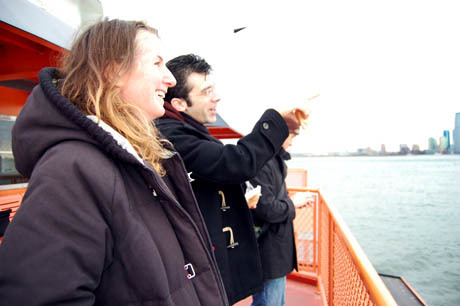 IMAGE: Kevin Slavin pointing something out to Katie Holten on the Staten Island Ferry, while Geoff tweets. 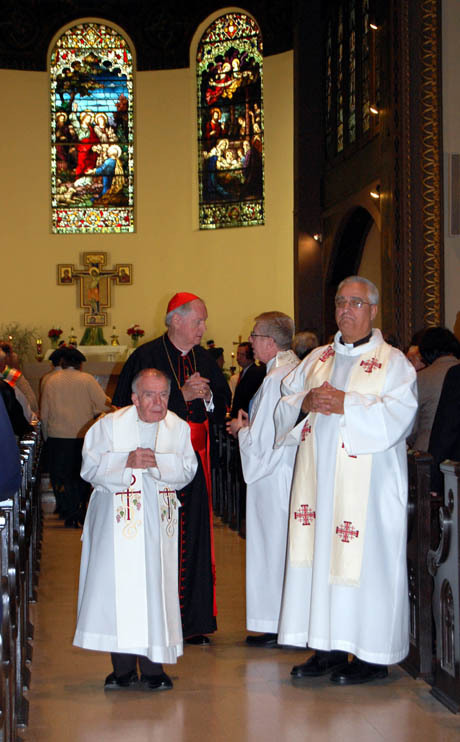 IMAGE: The ceremonial re-interment of the quarantined dead, St. Peter’s Catholic Church, Staten Island. Scott, Kevin, and artist Katie Holten were brave enough to rise early on a cold October morning to witness the ceremonial re-interment of the quarantined dead on Staten Island. Later in the studio, Katie visited North Brother Island, the final home of Typhoid Mary, while photographer Richard Mosse flew to Malaysia as part of his meandering exploration of vampires, family history, and the Nipah virus. 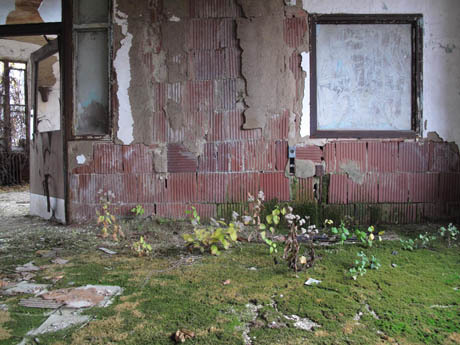 IMAGES: Abandoned buildings on North Brother Island, which was used in late nineteenth and early twentieth century for the quarantine and isolation of typhus, tuberculosis, and smallpox cases. 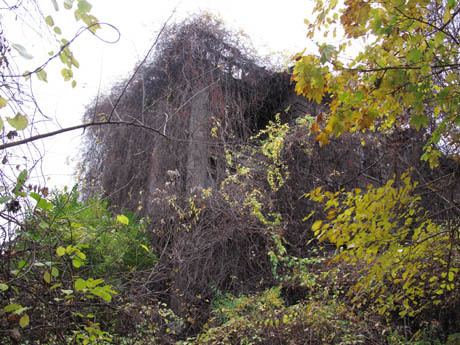 It is now overrun with kudzu, an invasive species. Photographs by Katie Holten.Her trip to the island was made possible by Michael Feller of the Parks Department, Tim Wenskus of the Natural Resources Group, and Todd Croteau, who drove the boat! Over the course of the studio, we’ve been lucky enough to welcome some fantastic guest speakers, who generously donated their time to help us think through the potential of our topic and ways to organise our forthcoming exhibition (coming to the Storefront for Art and Architecture this spring), as well as offering valuable feedback on independent projects. 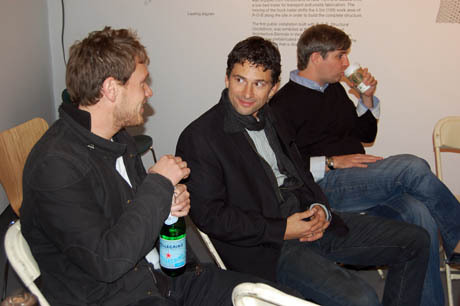 Thank you, Jake Barton (founder and principal of Local Projects), Bjarke Ingels (architect and principal of BIG), Paola Antonelli (Senior Curator of Architecture and Design at MoMA), Joseph Grima (Director of the Storefront for Art and Architecture), Laura Kurgan (Director of the Spatial Information Design Lab at Columbia University), and Glen Cummings (founder of graphic design studio, MTWTF). 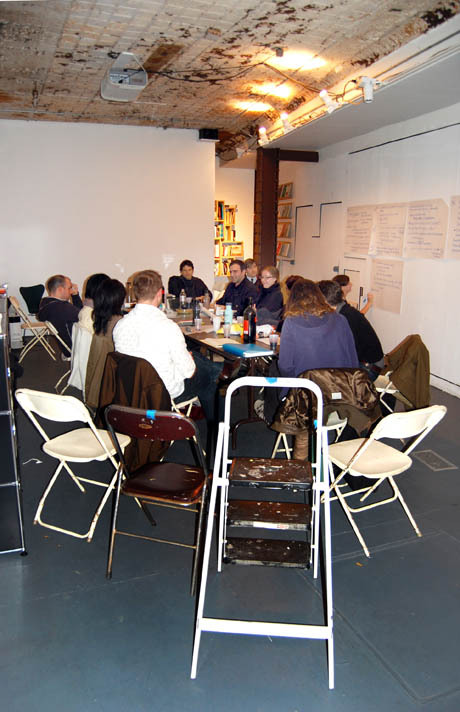 Some of them are even brave enough to return for our private beta-testing session this weekend, where they will be joined by several others, including Vito Acconci, Andrew Blum, Julie Lasky, Cassim Shepard, and Alice Twemlow, who have volunteered to spend their Saturday afternoon in Quarantine! 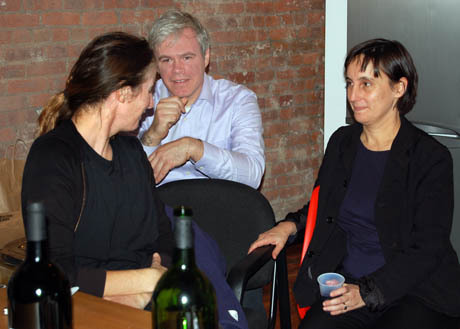 IMAGE: Katie Holten, Glen Cummings, and guest speaker Laura Kurgan talking at Quarantine, Week 7, hosted by Front Studio/Harvest. 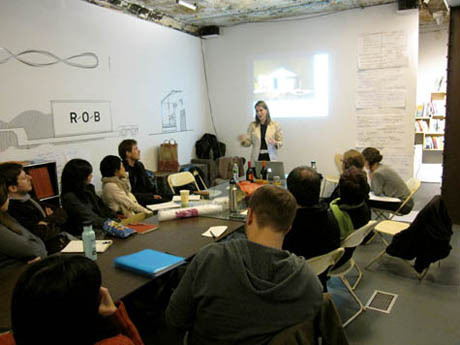 IMAGE: MoMA‘s Paola Antonelli visited the Landscapes of Quarantine studio during Week 5. 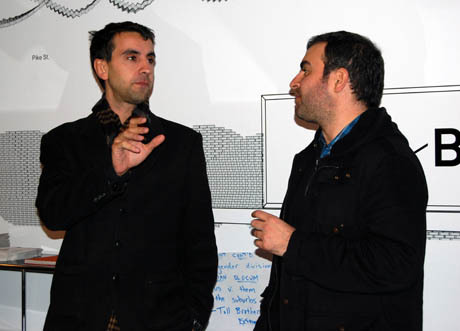 IMAGE: Joseph Grima, Director of the Storefront for Art and Architecture, talking with Daniel Perlin during Week 5. 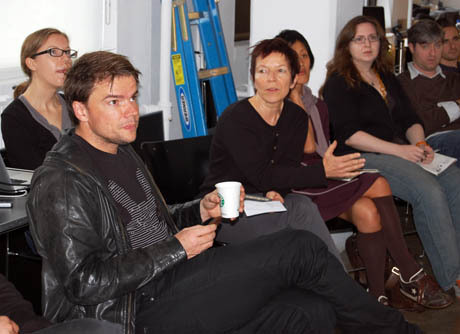 IMAGE: Bjarke Ingels watches Yen Ha and Michi Yanagishita present at Studio-X. To their right are Kevin Slavin, Amanda Spielman, Thomas Pollman, and Joe Alterio. Landscapes of Quarantine, as an independent, unaffiliated design studio, has been lucky to find several generous hosts: we’ve held our meetings at Storefront for Art & Architecture, Studio-X, Front Studio/Harvest‘s HQ, and architect Toshiko Mori‘s studio, and we are extremely grateful to each of you. And although we’ve had our last meeting, Landscapes of Quarantine is not over! Watch for our forthcoming exhibition (showcasing the projects developed by studio participants) opening at Storefront for Art and Architecture, NYC, in March 2010, and the accompanying Storefront Books publication (which is being designed by Glen Cummings of MTWTF, and thus will be beautiful, as well as interesting). 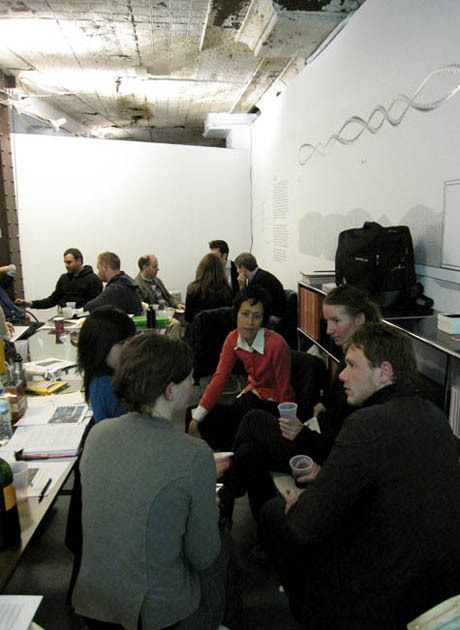 BLDGBLOG and Edible Geography will also continue to post occasional quarantine interviews: make sure to check out our previous conversations with Sara Redstone, Krista Maglen, Abraham Van Luik, Dr. Georges Benjamin, Jonathan Richmond, David Barnes, Alison Bashford, and Thomas Mullen. IMAGE: Benjamen Walker from WNYC setting up to record our discussions, Landscapes of Quarantine, Week 8. 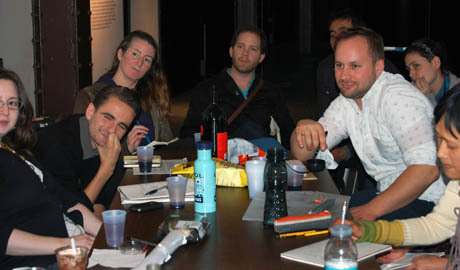 IMAGE: (left to right) Jordan Spielman, me, Joe Alterio, Josh Cummings, Katie Holten, Daniel Perlin, Yen Ha, Michi Yanagishita, and Scott Geiger chatting at the end of our final meeting, Week 8.